Trying to sum up the last day of a Synod is really difficult. Not least because you get into a rush getting away and heading for home. But today was the last day – not just of this session, but of a five-year term. For me, the end of ten years! And it was an atypical day, because we began with two hours in (not very) small groups, and ended with a Communion service in the rather 70s environment of the main hall. Fortified by Paula Gooder’s high-grade input last night, we integrated worship (saying the Benedicite and Psalm 8 together) and discussion. My group was fortunate to be led by the Bishop of Manchester (David Walker) and we covered a huge range – the nature of the Fall, religion and science, globalisation and consumerism. That paved the way for a heavyweight debate about how climate change could be combatted. The Bishop of Salisbury led it with a calm passion – best soundbite “The only reasonable approach to climate change is to act now. There is no Planet B”. A vote by show of hands was too close to call, so an electronic vote had to happen. The result: 160 for, 147 against, 13 abstained. ‘Do the math’, as they say. So – we encourage people to fast and pray. But we don’t set an unachievable target. Good decision. The outgoing Prolocutor, Christine Hardman told a superb story of her cycle ride (from Hertfordshire to York) last week, and the impact of cycling through deprived villages around the (currently subsidised) Drax power station. 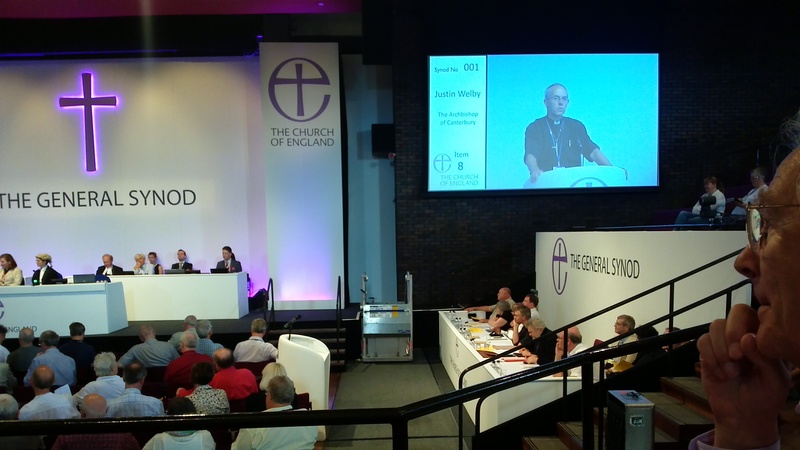 Probably her final contribution to General Synod – and a great one. Summing up, Bishop Nick said some had feared the debate would be ‘a snooze event’. It wasn’t. That will be because of the biblical input last night, and the group work this morning. Good process – Business Committee take note for the next five years. Women and the episcopate is back! The fuss over legislation having died down last year, and the first 6 women to be consecrated Bishops now being known (Libby Lane, Alison White, Rachel Treweek, Dame Sarah Mulally. 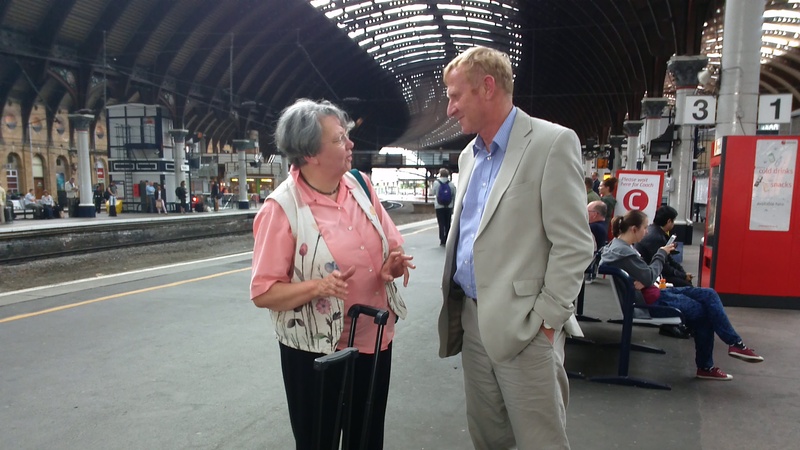 Ruth Worsley – coming to us as Bishop of Taunton! – and Anne Hollinghurst), you might think it was all over. But regular readers will remember that the House of Bishops have ‘Five Guiding Principles’ to ensure all shades of theological view within the church can flourish; and a Code of Practice governing the way in which parishes who can’t accept the ministry of a woman Bishop are treated. 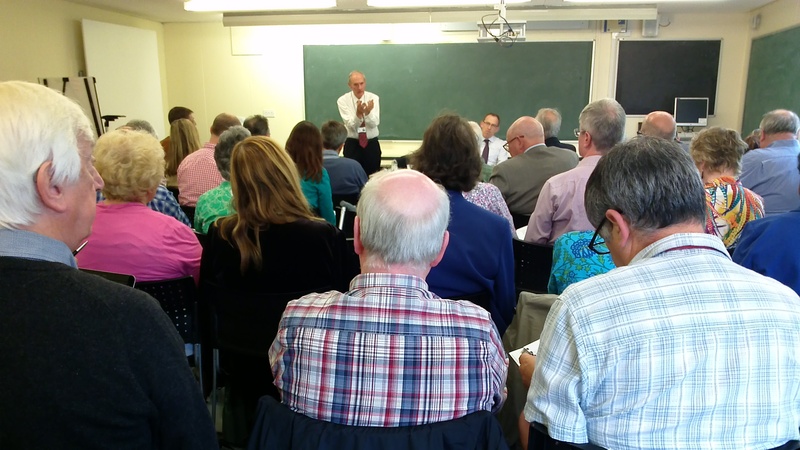 There is provision for an independent adjudicator – a kind of Ombudsman – who can intervene if a parish feels its own Bishop is not dealing fairly with them in these matters. The person chosen is Sir Philip Mawer, a former Secretary-General of the Synod. He is someone who knows the Church of England backwards. How will he assess whether he was getting a real complaint or just someone grinding an axe? How would he encourage people to complain without fear? Will he be assessing the parish’s theology, or just the process that led to the complaint? The document was very focussed on PCCs – what would happen about ordinands who felt they were being badly handled? Can he be sure any PCC complaint was truly representing parishioners’ views? Sir Philip did not attempt to give answers, but simply said he was collecting views in order to help him get his final guidance right. By and large, I felt people were well satisfied, and huge trust in him was expressed. You can read the current draft here, and he is open to comments for a couple of months. NIMBY-ism – the things do look hideous in a landscape. Then it was time for formal farewells, and plenty of them. The Chair of the House of Laity and the Prolocutor (chair) of the Canterbury Convocation are both leaving after many years in Synod. (There will be some very interesting elections in the autumn to replace them). Archbishop Sentamu told us that there were 99 people known to be standing down, including such luminaries as Fr David Houlding and Christina Rees, key people in the long haul to the ordination of women as Bishops And there will of course, be others, who don’t know they are leaving Synod, but will be told, rudely, by their diocesan electorate this September/October. to encourage some people (lay or clerics) top consider standing for election. The time is nigh! Talk to your Diocesan Secretary and s/he will have the timetable. Or look at the really helpful info here. I am amazed at how this blog expands its readership. My preview post on Friday morning had 51 visitors. Saturday that had grown to 85; Sunday’s total was 96, and by lunchtime today (Monday) it had shot up to 202. Nearly all are for the UK, but I appear to have single readers in Russia, Oz, the Philippines, Uganda and the USA. Oh, and three people in Turkey. We concluded with a Communion service in the main hall. It was good to end in prayer together. As I have said before, Synod worship is always moving: a sense of being among friends, but also of being wrapped up in the purposes of God for our church. It was heightened by the sadness of parting friends. As the song from which I pinched today’s title says: Sad deserted shore, my fickle friends are leaving. Ah, but then you know it’s time for them to go. I can’t quite believe I have spent ten years of my life on General Synod. Where did it all go? This entry was posted in 2015: July - York and tagged Archbishop Sentamu, Church Commissioners, Church of England, General Synod. Bookmark the permalink. I’ve enjoyed your blogs, as well as others. It’s interesting to see how other people view the same event. However, I was disappointed with your almost total lack of engagement with the debate on Friday afternoon. First of all, the Bp of Manchester showed himself to be partisan and upholding the ‘establishment’ in his comments about the various amendments. His comment on Oxford and Birmingham Diocesan Synods ‘graciously agreeing’ verged on the dismissive and rude. I shall be taking this up with him. 3 dioceses have now voted overwhelmingly that the C of E should disinvest in fossil fuels, disinvestment which goes far beyond the current agreement. As we heard in her speech, the Archbishop from Sweden reported that the church in Sweden has disinvested, the URC has, the Methodist church has. The chairman even refused to allow a proper debate. This is shameful. Yet again the CofE is shown to be in the pockets of the establishment. Engagement by Barclays in South Africa did not work. But refusing to include South Africa in the sporting world and the boycott many of us had on buying SA products did. Apartheid fell. Yet again the CofE is lagging behind and siding with the rich. The current exploration undertaken by in particular the oil companies will only result in finding reserves which the planet cannot afford to use. So why waste the money searching for them? Not long ago the CofE lost a huge amount of money because of the property crash. We are now set to lose even more when the shares in the oil companies crash. But even the financial arguments were dismissed and the ethical ones barely acknowledged. CofE I am disappointed with you. And Blogger you have not served us well. Hmm… This is interesting. There wasn’t a debate on Friday afternoon (except on the Report on the Agenda). Did you mean the investment debate on Monday afternoon? If so, it’s a bit harsh to say I was not engaged, as I made a speech criticising the solar power aspects of the investment report. I don’t claim to do anything like a full report – I leave that to the Church Times and the Report of Proceedings. I do say it is a personal account, and I write about the things I was there for (I don’t sit in the chamber all day every day) and the things I am interested in. I’m sorry, Anne, if that means I donut see it the same way as other people. But thanks you for the initial affirmation! Apologies for my error in saying Friday instead of Monday. When I said that I didn’t feel you were engaged in the debate (I know you contributed to it re solar panels and have just this afternoon had a conversation with somebody who has a similar problem in the Diocese of Gloucester), I only meant engaged on your blog. Obviously you can’t write about everything. But I see no reason why I should not tell you that I am disappointed. Anyway, I won’t comment again. Over and out. Most interesting to read about General Synod from Debbie Flach. It is easy to lose touch when living on the other side of the world. Thank you.